IN 2018 WALK FREE FROM ALL GUILT AND CONDEMNATION BY ORDERING THE BOOK 365 DAYS OF GRACE!!! YOU HAVEN'T MADE TOO MANY MISTAKES! Watch the video above about how God will ALWAYS get you to the good purpose and plan He has for your life due to His grace despite the mistakes you may have made! Please contact us to talk, for prayer, or to partner financially with us to save lives! Email us clicking here or by completing the "Contact Us" form. Contributions can be made over our website on the "Partner/Donate" page or mailed to PO Box 53020 Chicago, Illinois 60653! Fill out an application to volunteer on the "Volunteer Application" page. We look forward to hearing from you. 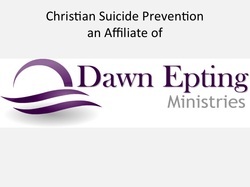 Christian Suicide Prevention (CSP) an affiliate of Dawn Epting Inc., is committed to saving the lives of Christians and non-Christians alike by educating and empowering people through Biblical principles to understand the grace of God and that they are not condemned through a professional crisis phone line and e-mail service. Christian Suicide Prevention started as the nation's first after hours (9pm to 1am), seven day a week, 501c3, tax exempt, Christian staffed, suicide prevention and relationship counseling hotline for Christians and non-Christians alike that are 18 or older. Today we conduct seminars regarding suicide prevention and speaking engagements that encompass the grace of God. It is located in the Chicagoland area. We offer speaking engagements, seminars, prayer, and biblical advice to people worldwide who have been hurt or rejected in a romantic relationship. We also extend our services to those dealing with a difficult life situation such as the death of a loved one, divorce, financial crisis, physical illness, etc. We have received calls from every state in the U.S. and even Canada! Go to our "Blog/Testimonies" page to read today's inspirational message. Click here to listen to an audio clip of a man who overcame the temptation to commit suicide after the termination of a relationship. Read accounts of those who contemplated taking their life but conquered the desire through the power of God on this page as well. Have faith in God's ability to heal your situation and know that this is a temporary not permanant season in your life. This brief chapter in your life too shall pass!